Its time to build a new welding forge..... for several years I've been using a KaWool insulated welding forge, mainly due to the high cost of castable.... but seems I'm doing much more forge welding these days, and the lining only lasts a couple of months.....in short I'm just tired of repairing, and being down for a week until things cure enough to use the forge again. 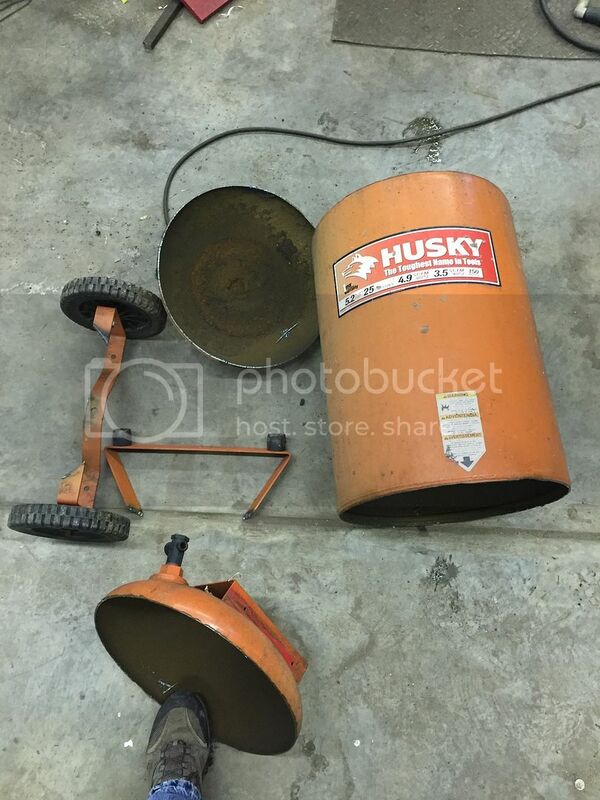 So, time to "bite the bullet" and spend the money on a forge that should last for several years. 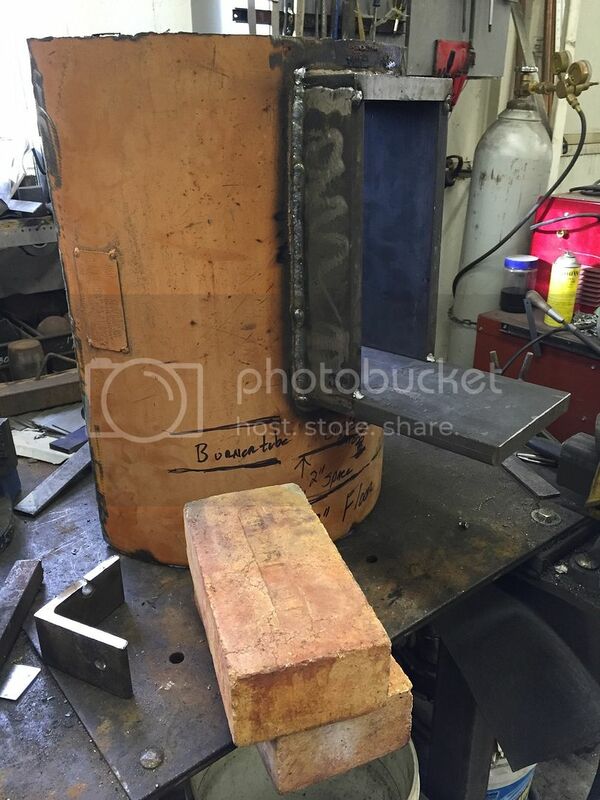 I've been forging larger and larger billets, so I decided I wanted a "chamber" size of at least 16" long X 10" Wide. 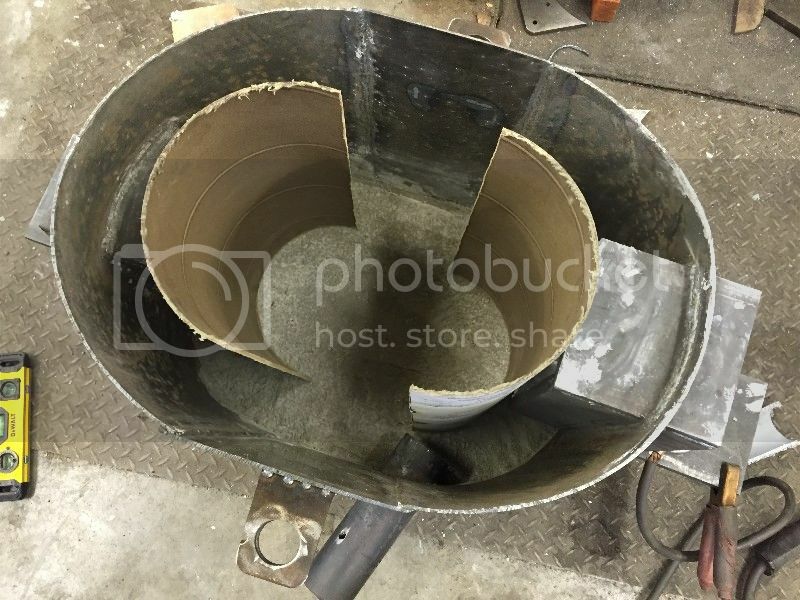 Since the castable needs to be at least 3" thick to perform well, the 16" compressor tank is just right. 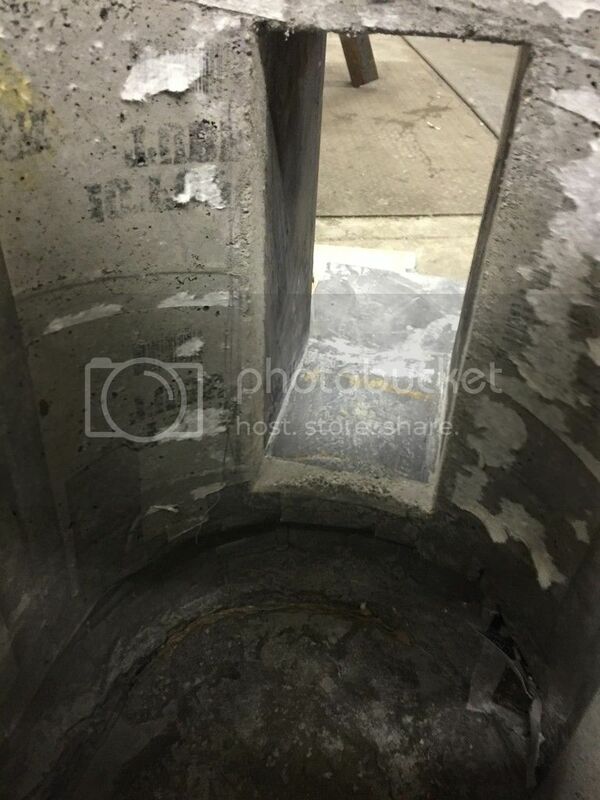 In order to achieve the distance I wanted, the tank was split lengthwise. First I build the openings of 3/4" X 6" A36, making the front door 10" X 4 3/4". This allows me to stack standard sized firebricks to make the opening smaller, or remove them to enlarge it.....depending on how large the billet is. 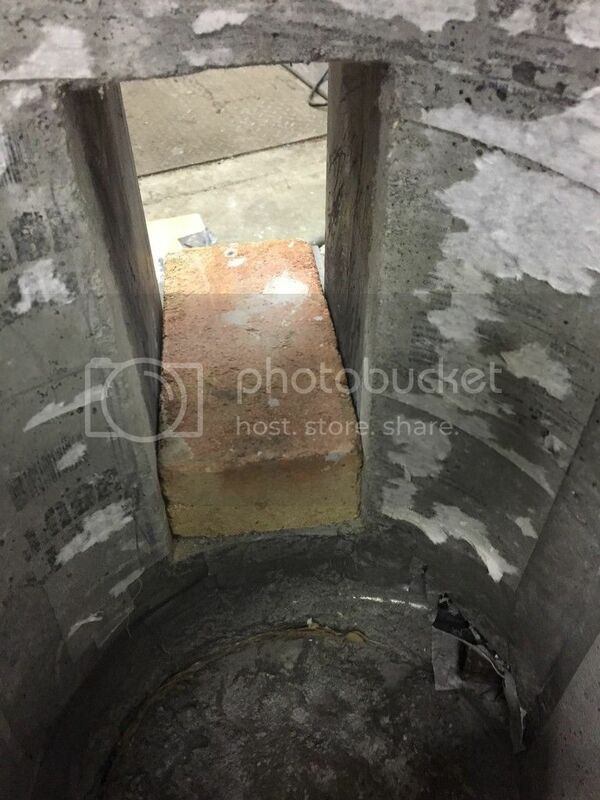 I also built a "back door" that is 5 1/4" X 4 3/4"..... that way it can be closed off with two firebricks when not needed as a "pass through". 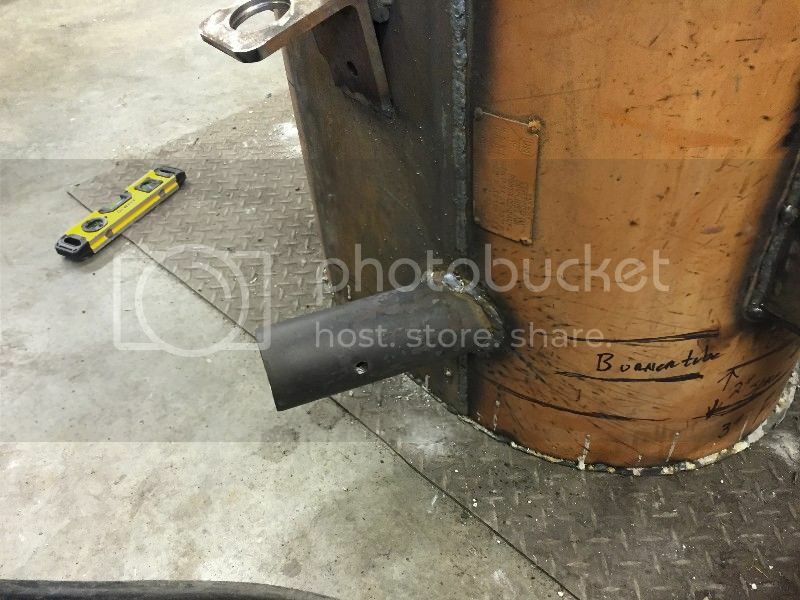 Once the "doors" were welded to the shell, then it was time to add in 8" extensions on each side to create a large oval. 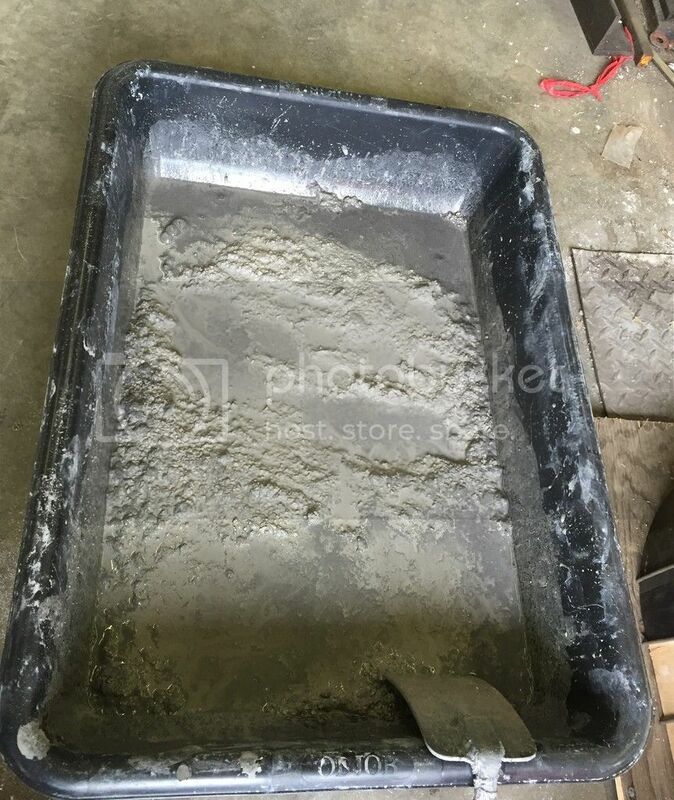 After waiting for 6 bags of Mizzou 3000F castable refractory to arrive, it's time to pour the floor. Mixing tube, castable, water, and all my homemade tools for mixing and getting the castable in place. I put a thin layer of castable in the bottom, then added 5 fire bricks as "filler" to save as much castable for the walls as possible. I spaced the bricks, filled the gaps, then put about a 1" layer over the top. 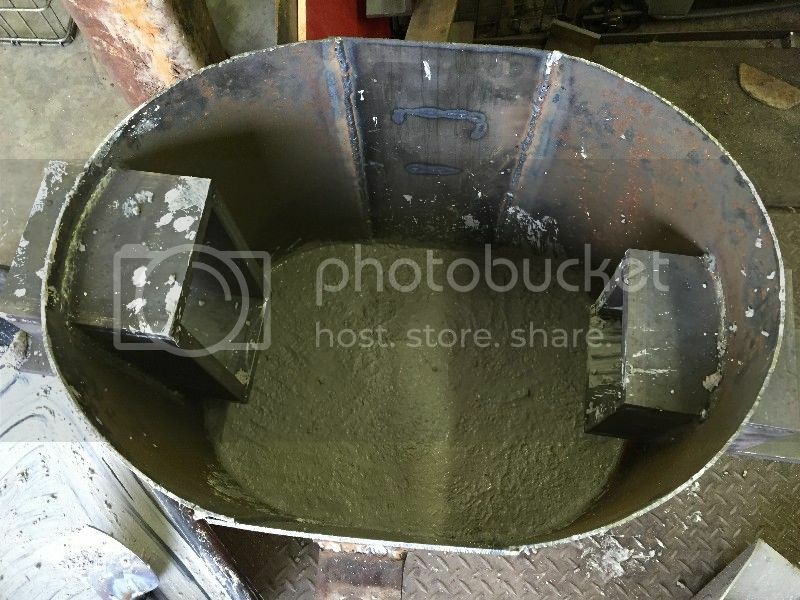 Now its going to be about a week of cure time before I can locate and install the burner holder, then it will be building the interior forms, and then hopefully I can "fill er up". 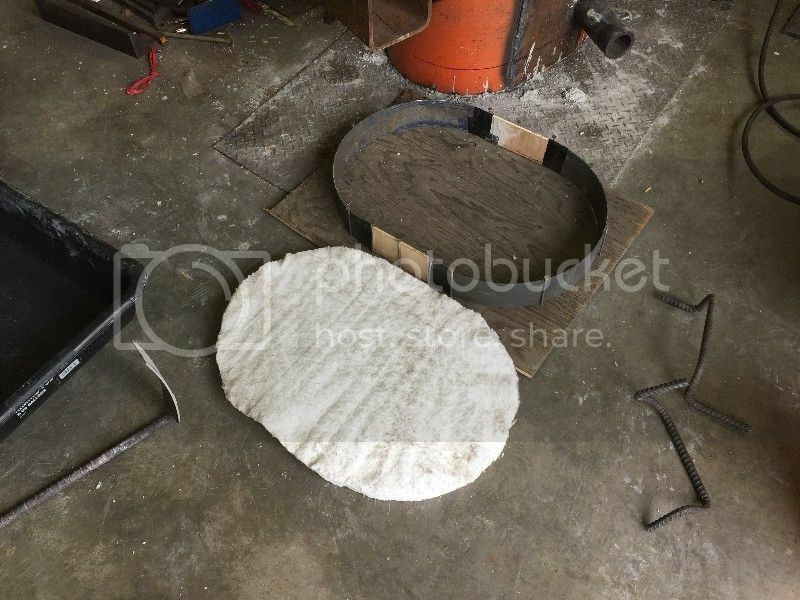 With the castable here in the shop, its now time to build the forms, get everything in place, and get this forge one step closer to completion. Next I built the forms. 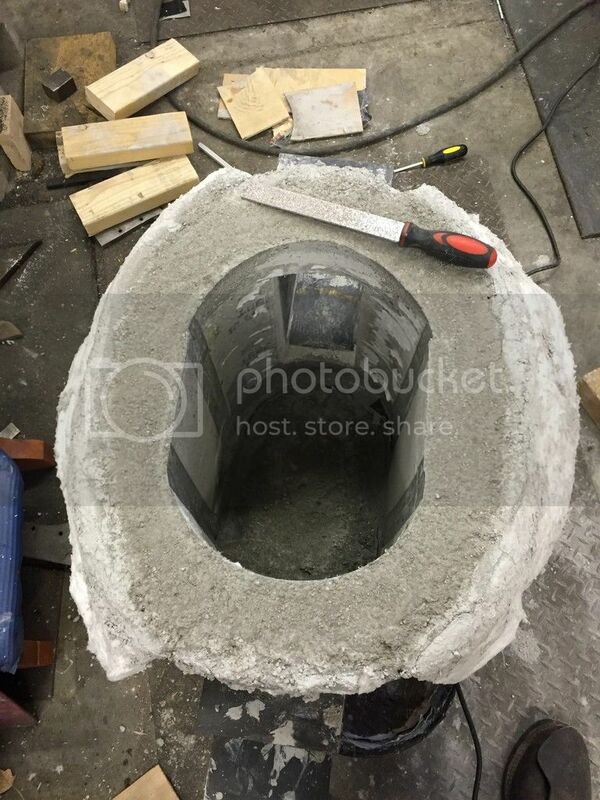 10" diameter concrete from tube from Home Depot. 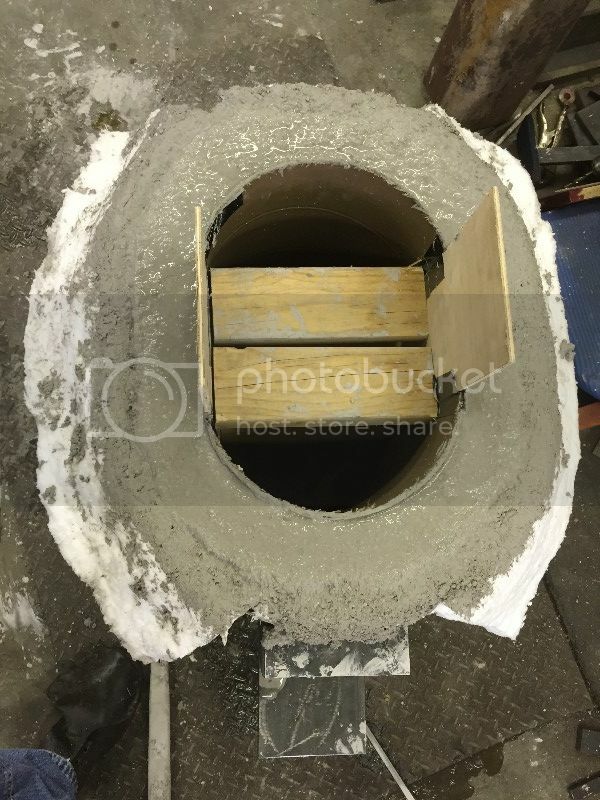 19" piece, split down each side. I used some 1/4" plywood ($5 for a 1/2 sheet at Home Depot), and cut 6" wide X 24" (just because it was that size) pieces to fill in the rest of the form. I also picked up a 2", sch 40 PVC conduit, 90 degree. I had to heat and form it to get the radius I needed. 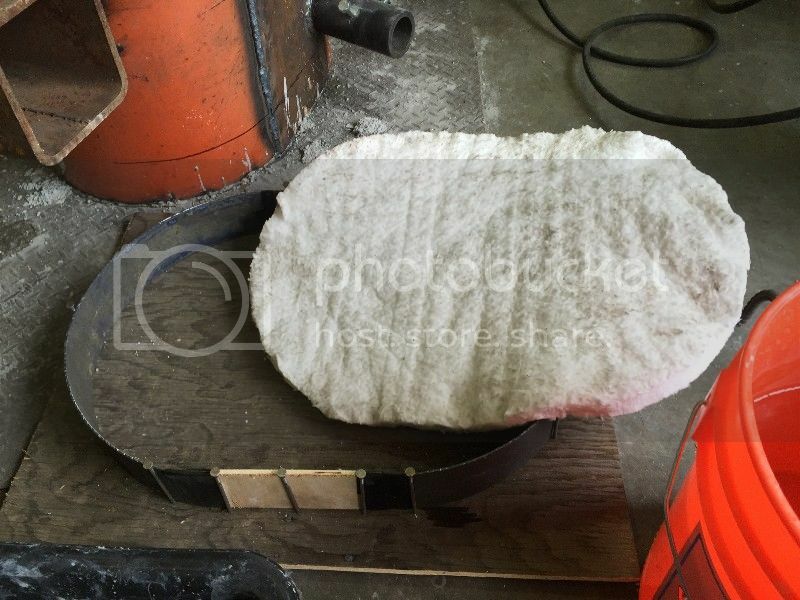 But the idea was/is to form a channel in the castable that will "guide" the burner flame around the inside. 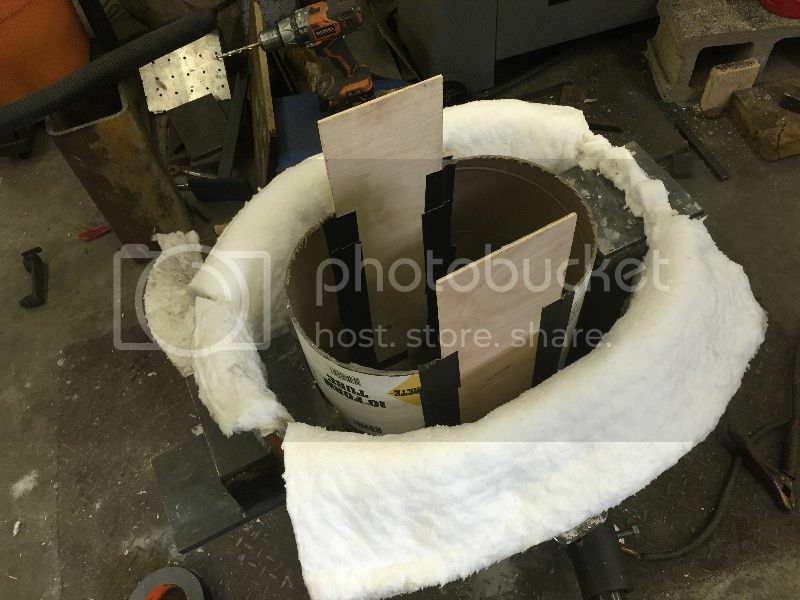 After getting the dent I needed, I sawed the PVC with a taper around the curve that terminates about mid way on the opposite side of the forge that the burner enters. 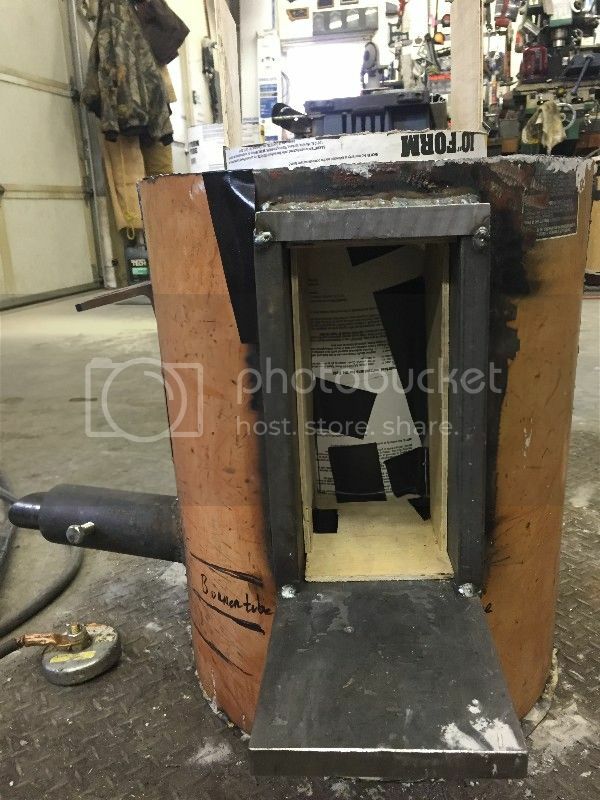 I also used the 1/4" plywood to fill the front and back "doors", trying to ensure that castable would cover most of the steel portions of the doors.....again....used the duct tape to keep things in place. Now to leave it alone for about 2 weeks.....then try to take the forms out. After that I suspect it will be a month or so before it will be cured enough for some firings. 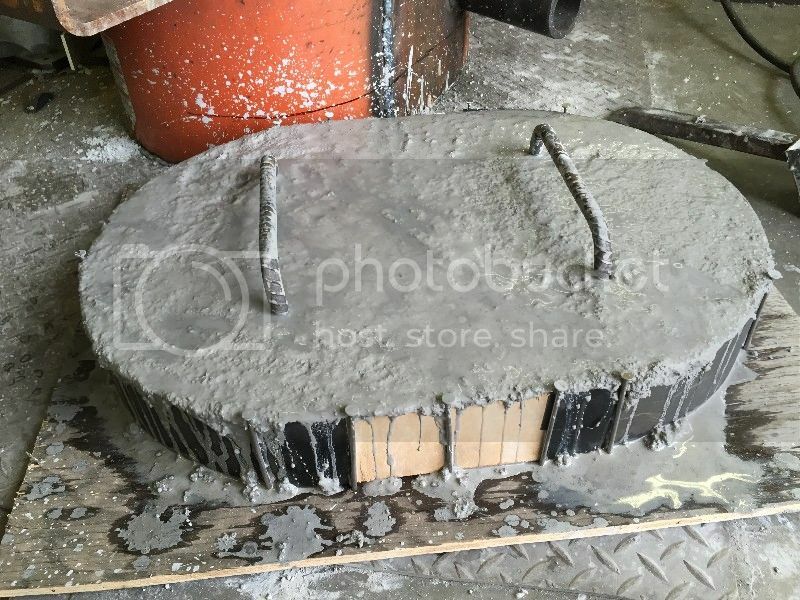 The down side to a forge like this is that amount of time it takes from beginning the build, to being able to use it, but experience has taught me that curing any type of refractory and/or coating is best done naturally. Otherwise the life of the material is dramatically reduced. 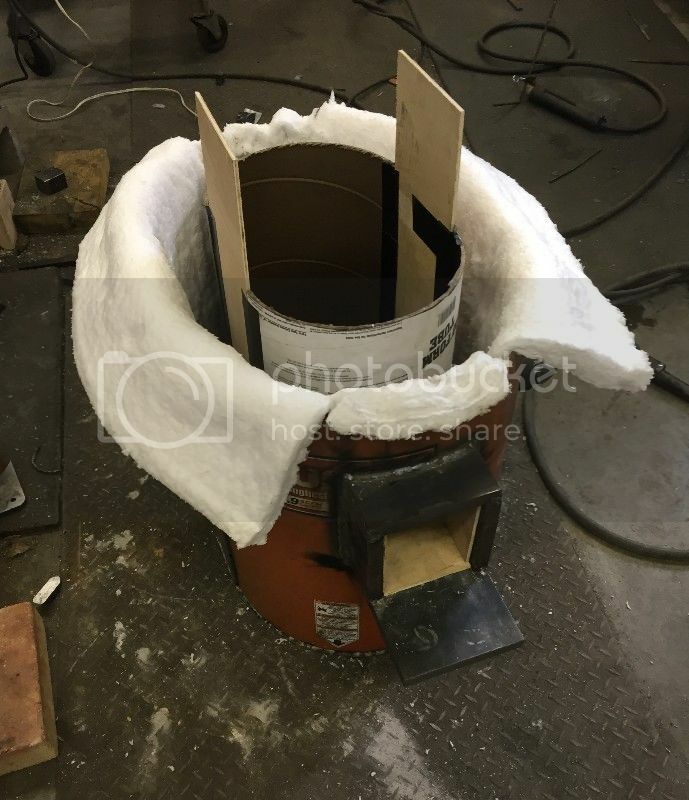 Hopefully once this forge is cured and ready to use, it will last for several years, versus having to reline the kawool welding forge every 2-3 months as before.....and having to make repairs in between. Last edited by Ed Caffrey; 02-25-2016 at 03:46 PM. Good job Ed. It looks like it should last a long time. 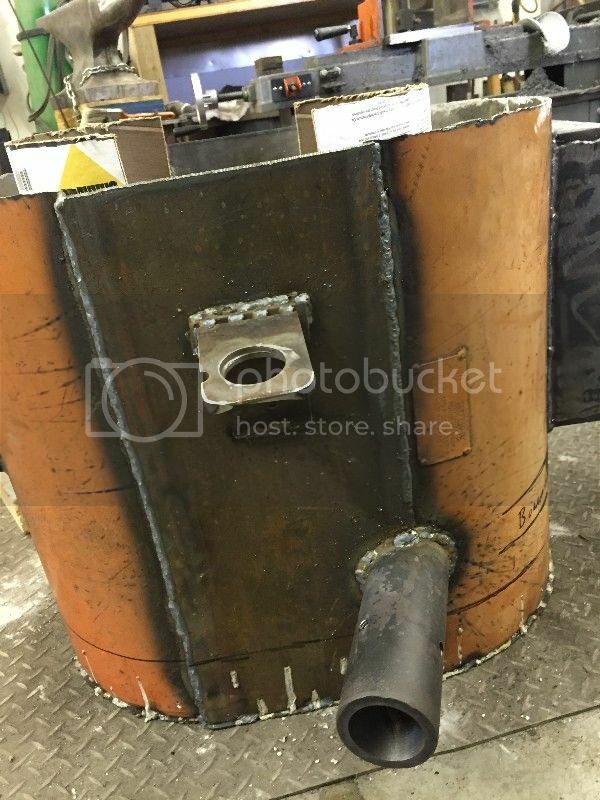 This is a good WIP, I can't wait to see the burner set up. That is the one area I am having issues with on my forge. I'm going to use an existing burner....one that I've been using for about a dozen years. 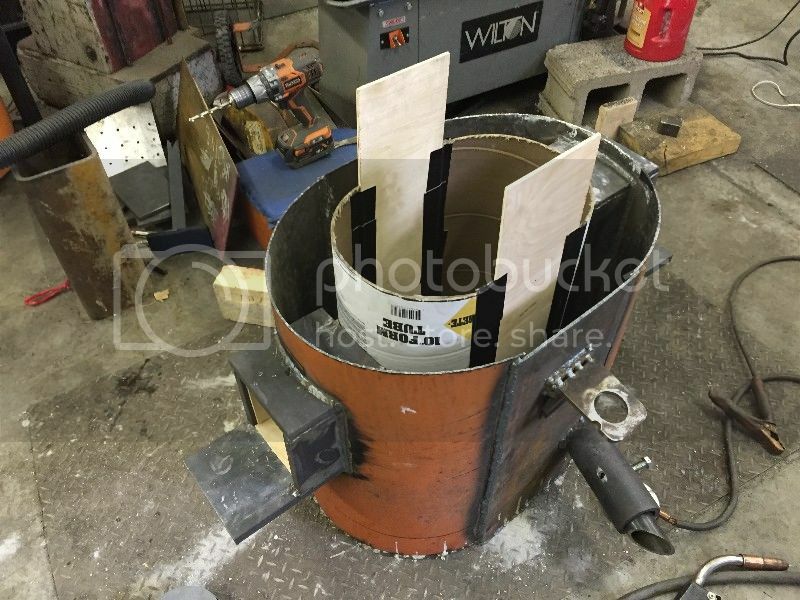 I'll get some pics of the burner, and will explain how its build. 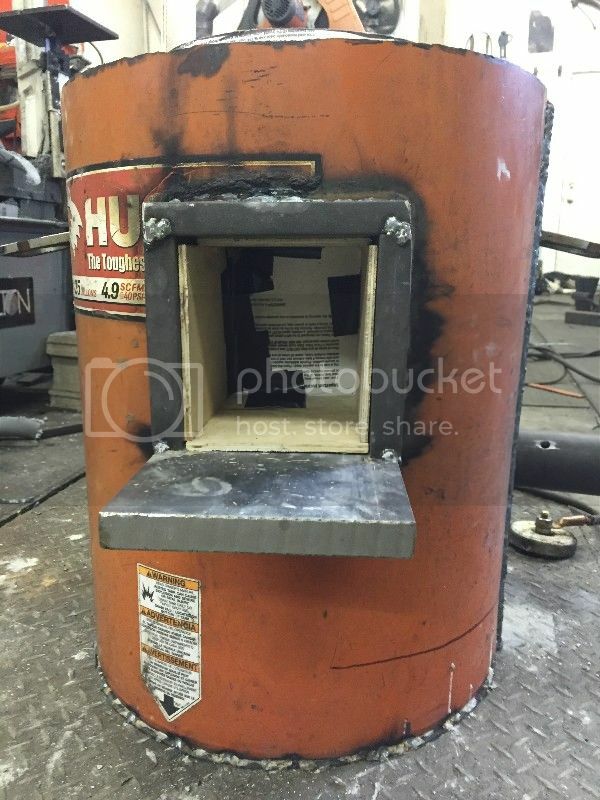 In my opinion, burners tend to be the part of a forge that most people try to "over engineer", and in doing so, are generally the causes of most forge issues. The one I used is a simply, single forced air burner. 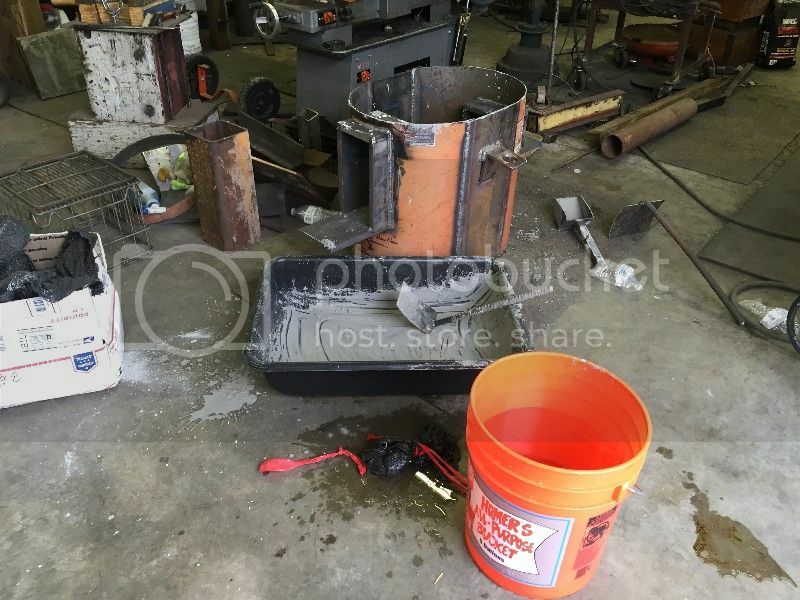 The first rule for building any forge in order for it to be useful and reliable is K.I.S.S. 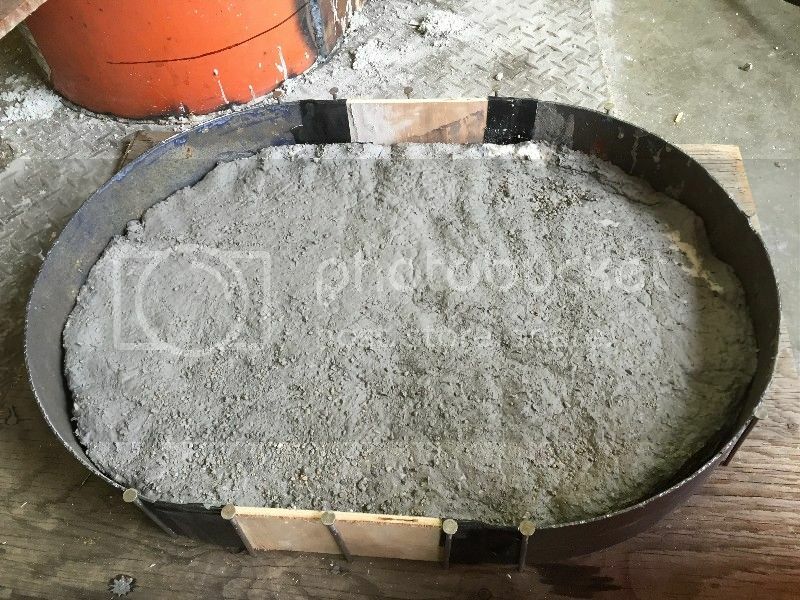 Would putting a dehumidifier in the area of the forge speed up the curing a bit without compromising the refractory at all? Great set of pictures Ed. Folks are always asking about forge builds. Nice go to thread. Doug..... A couple of things that I think can be used without problems are a "heat lamp", and/or a small fan. 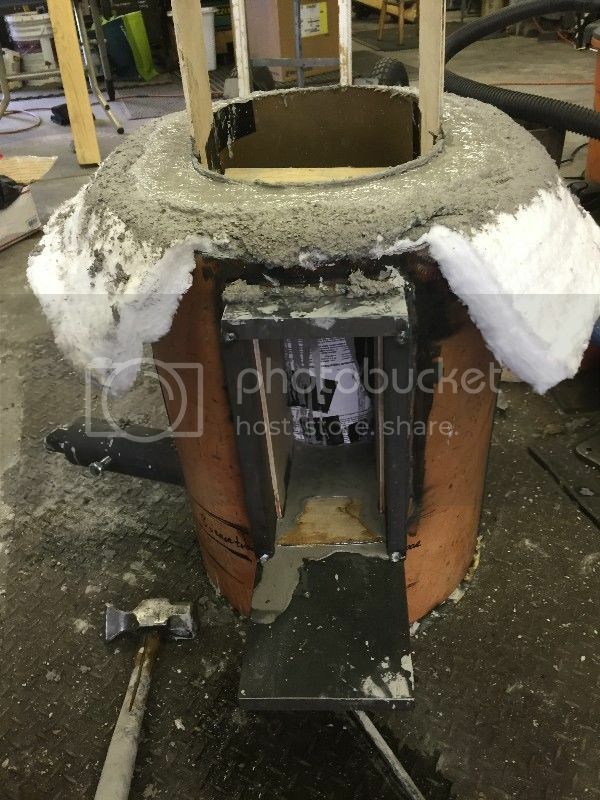 The reason I gave the warning is because I see a lot of people who recommend firing the forge "gently" to speed along the curing process...... not a good thing in my experience. 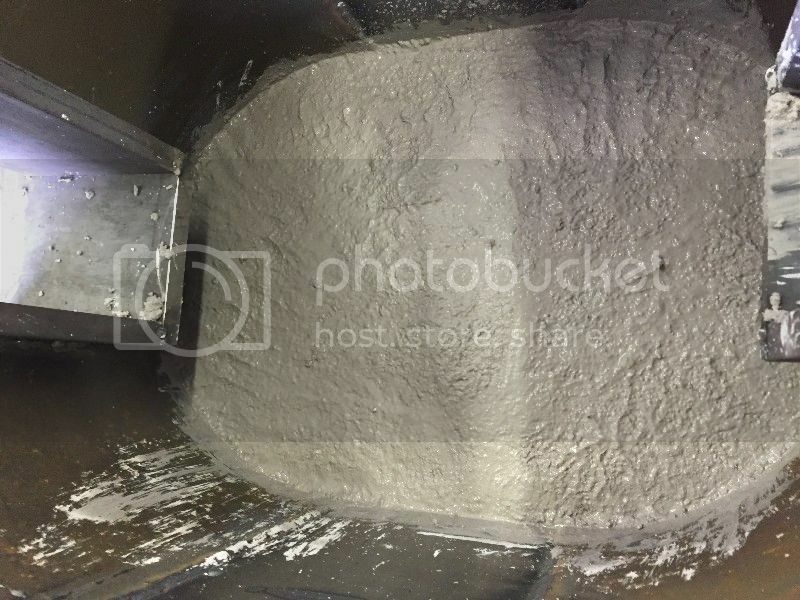 In the case of castable refractory, doing something like that will often "flash boil" tiny pockets of water within the refractory..... weaking it greatly, or in some cases even causing small chunks to "pop" out. 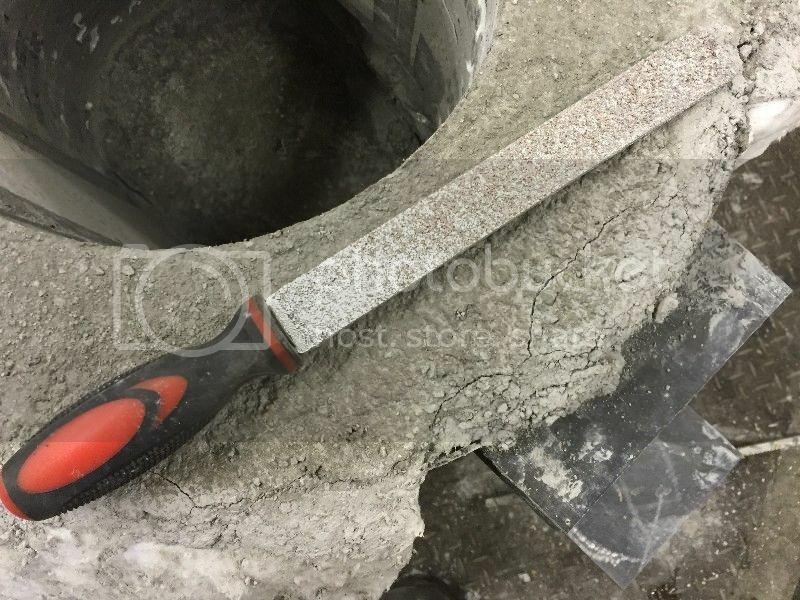 Same thing with coatings like ITC, ect..... if you cause any of those to "bubble" via firing when they are not cured, the coating, when it bubbles, will usually fall right off. Craig!!! How you doin pal?!? Hope all is well with you.....we need to yak sometime soon. 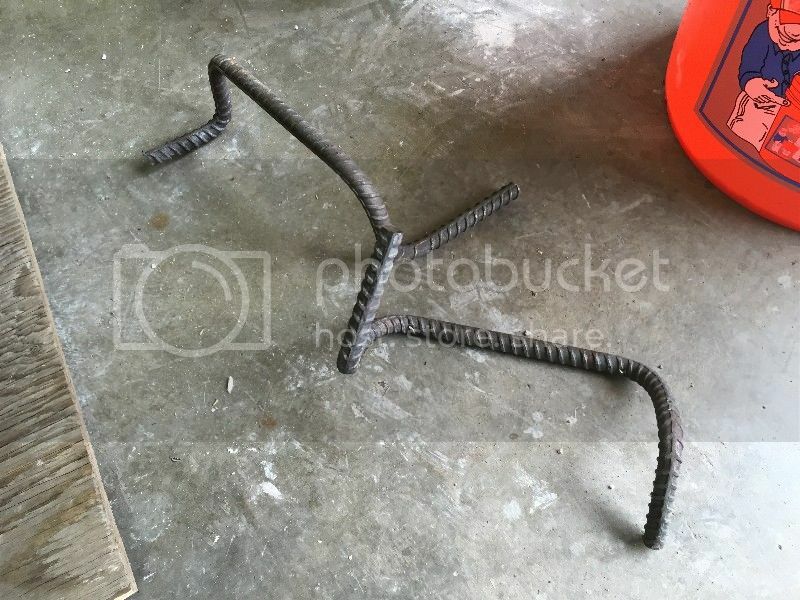 Excellent whip Ed , I have a spare compressor just waiting for an additional forge similar to this , I will be using this , good idea on the conduit as well , thanks for the time and info posting. 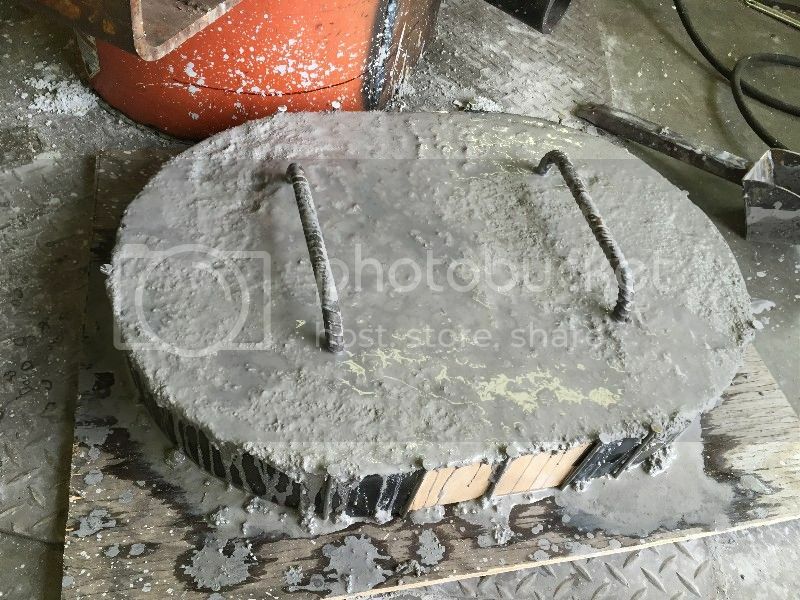 After checking on the new forge this morning, I was pleasantly surprised to find that it appeared cured enough to remove the forms....so I did. It wasn't too tough of a job. 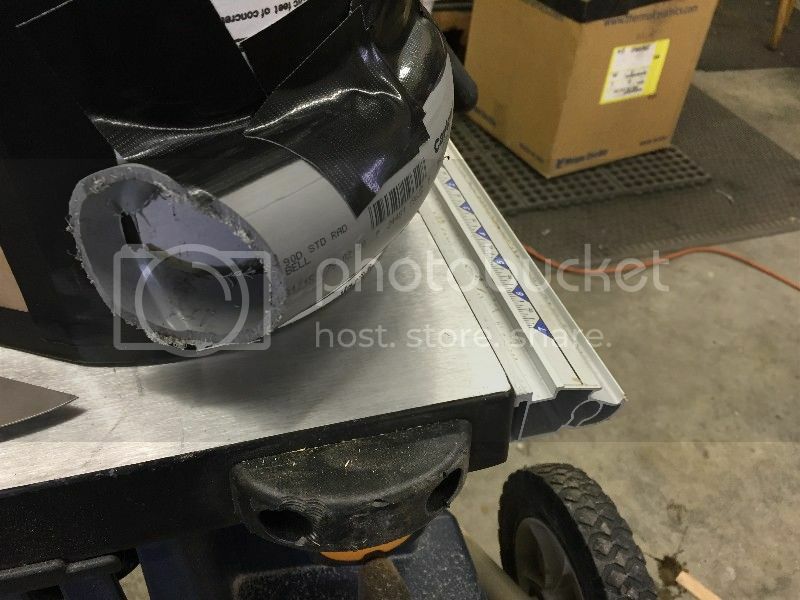 I cut the tape with a razor knife, and pried the forms out of the "door" areas. Luckily, everything came out smoothly. 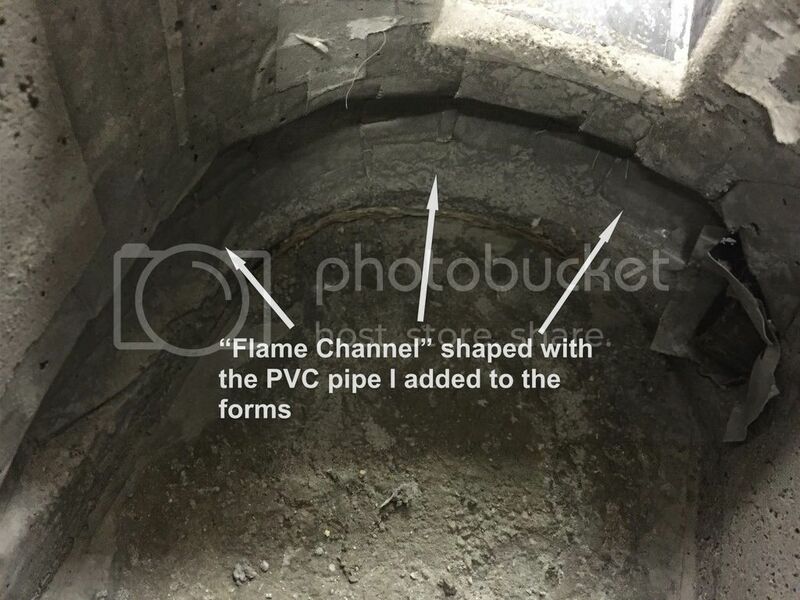 I'm think that forming in a "flame channel" might have been a good thing. Guess I'll find out when it cures enough to put in place and fire. 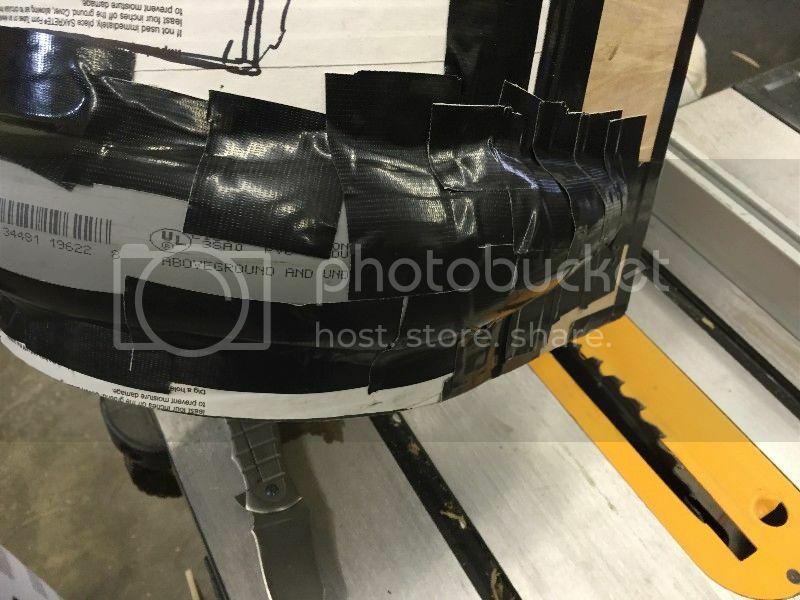 A little bit of the duct tape got hung up in the curing refractory, but my guess is that won't be any big deal....it should just burn out when I fire the forge for the first time. 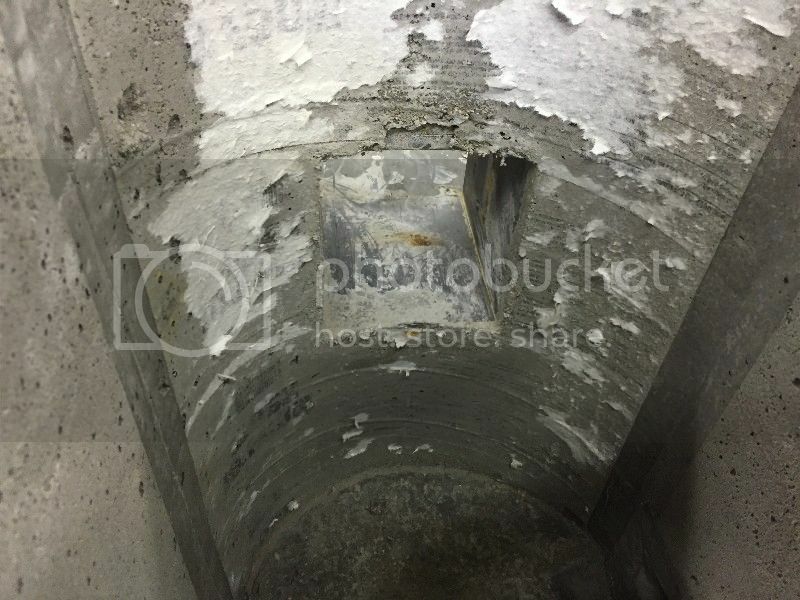 I'm thinking that after it cures, I'll take the torch to the inside to burn away all the stuff left over by the forms...... gotta make sure the surfaces are fairly clean prior to coating the interior with ITC-100. As it gets closer to completion, I'll take some pics of the burner assembly, and might even do some video. Very nice WIP! 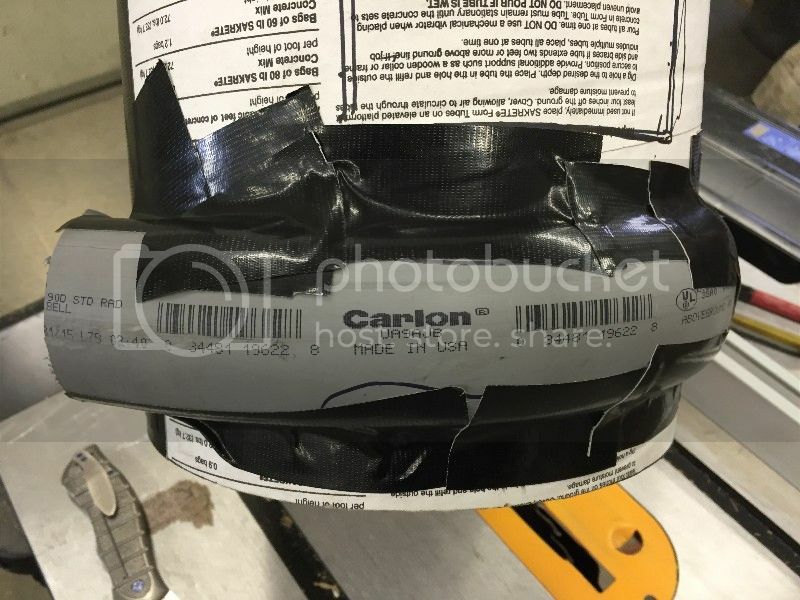 I love the judicious use of duck tape! 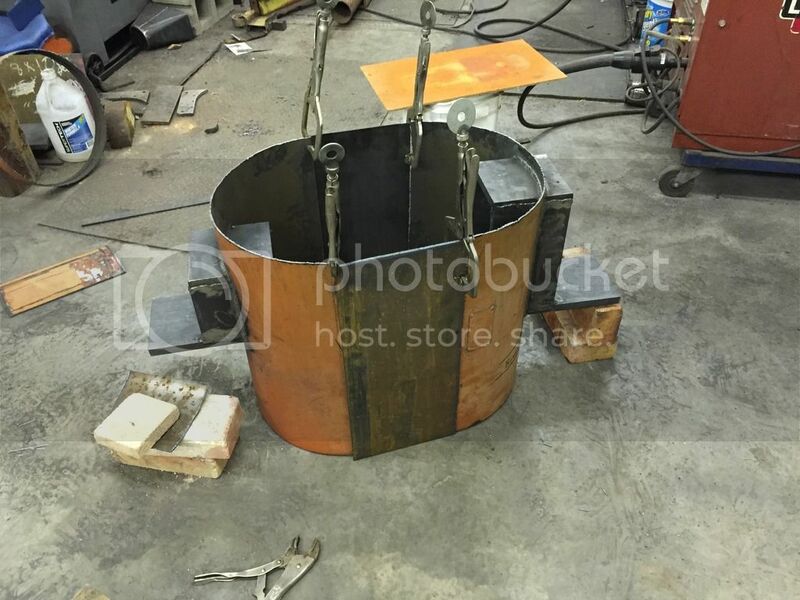 With the forge curing nicely, I figured I'd better get busy and build the lid. 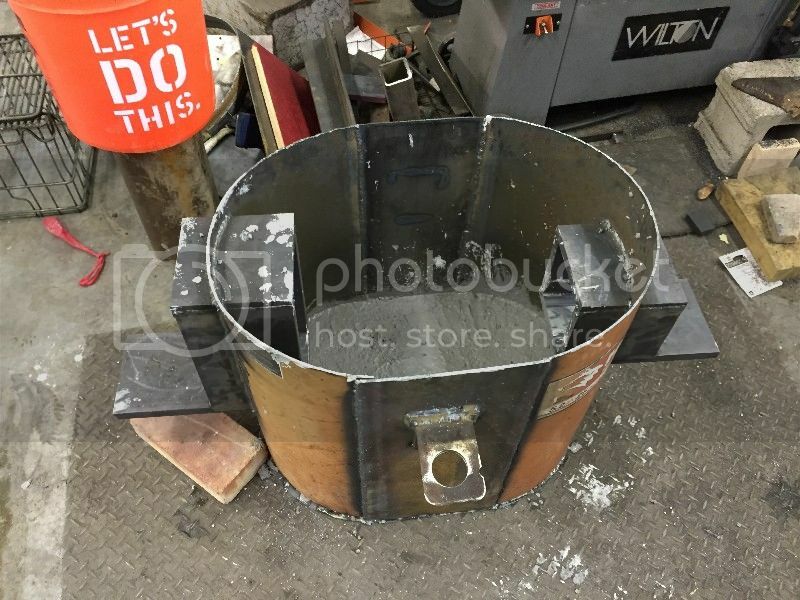 I cut off a 3" tall section of the same diameter pipe that I used for the forge body...... Split it, and then filled in the sides/gaps with 1/4 plywood to make it match the outside diameter of the forge. 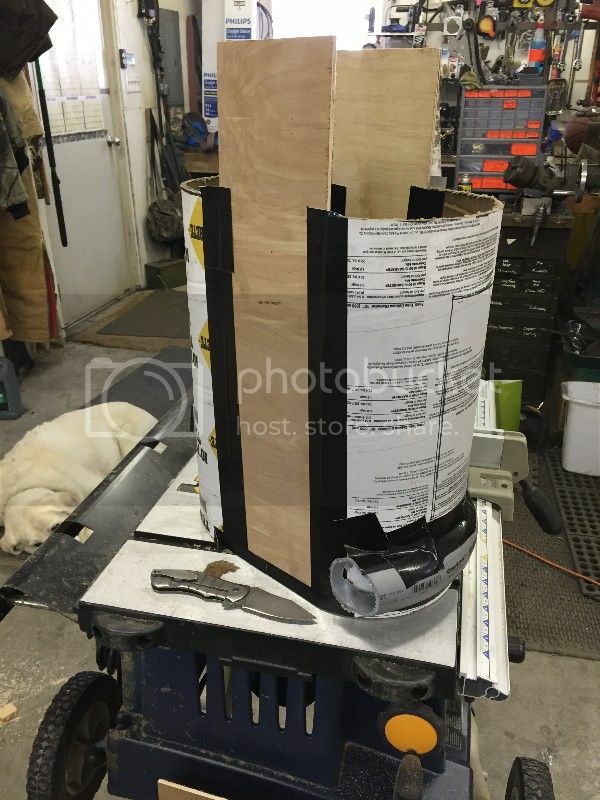 Laid the form on a piece of plywood, and used nails to ensure everything stays put. 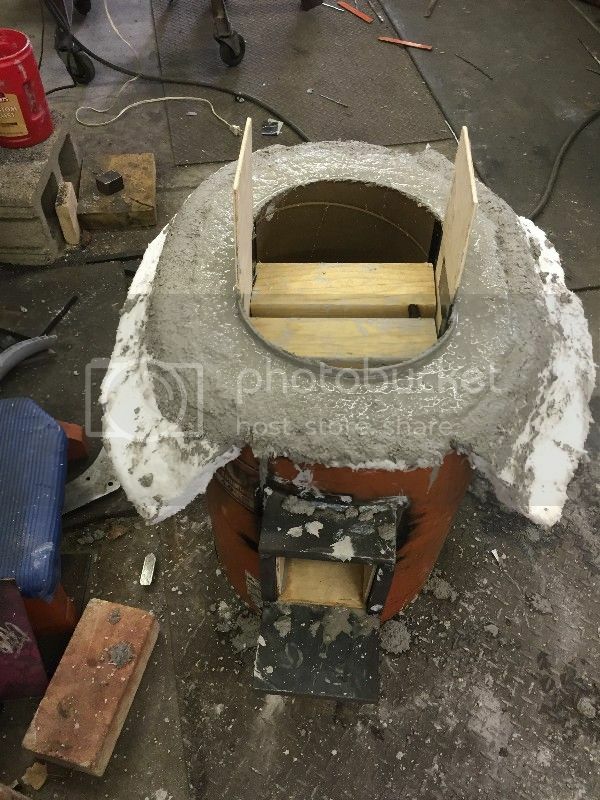 I decided to build the lid just the reverse of the forge.....putting kawool on the inside, and making the rest out of castable. 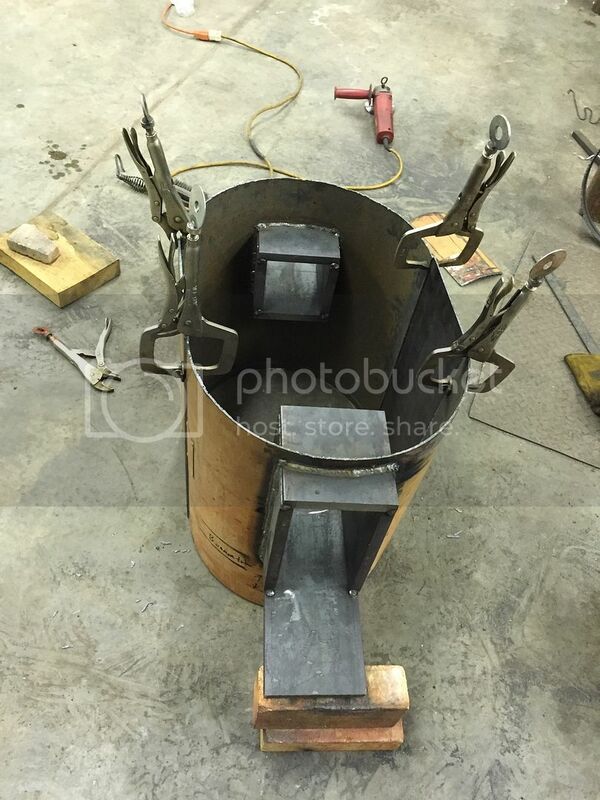 The pieces of bent rebar will be handles for the lid....inset into the castable. I got the castable way more wet then I wanted to......but I guess it is what it is. Now it's just a matter to curing time before I can do anything else. Once I get it in place and fired, I'll update the thread with how it works out.